I seem to be back in a good place with my running, after having some time off for injury in October and November. My knee and shin pains have subsided since getting fitted for some trainers which better suit my gait. A fun and festive run to finish the year with the Team Naturally Run girls. 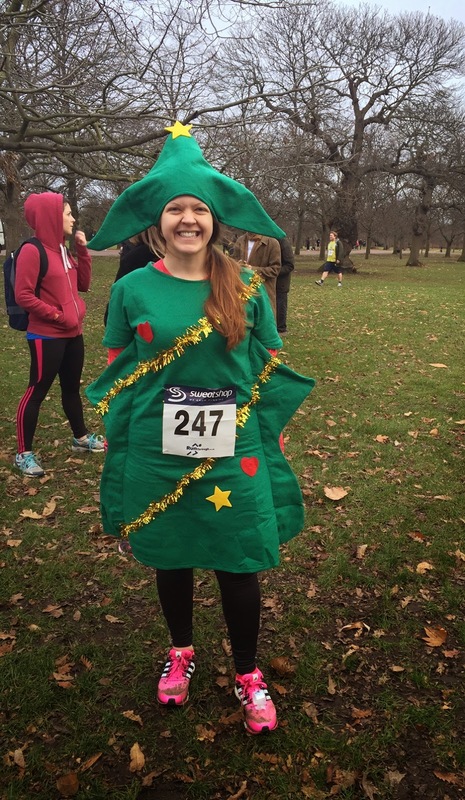 In December 2013, a big group of us took part in the CAFOD Nativity Run dressed as elves, and it was suggested that we carry on the tradition with another fancy dress race for Christmas 2014. I definitely was not out to set a personal best, especially as I was dressed as a tree, so I just took this as an easy run and chatted to Leah for most of the 5km lap. The hat kept slipping down over my eyes and my tinsel was blowing away in the wind! It was fun watching the runners in a variety of outfits, including a snowman who claimed to be “sweating his snowballs off” in his costume! Greenwich Park holds fond memories, as it is where Glen and I got engaged in August 2008, but damn it has some tough hills! I was feeling really indecisive about whether to go for the 10km distance, or opt for the shorter 5km option. As I struggled up the steep but gradual incline towards the half-way point I decided to finish and collect my medal and mince-pie after 5km. The medal is fantastic, well worth running for this alone. I usually don’t get the chance to take part in parkrun as it clashes with the tri club swim sessions. But as swim training was cancelled for the festive period I had the opportunity to get in a few Saturday morning runs. Nikki, Amy, Hayley and I met at our local Harrow Lodge event, for a pre-Christmas parkrun. This course is mostly on grass around the boating lake and it was thick with slippery mud in places, so I had to take it easy to avoid slipping! Our trainers were caked in mud afterwards, my new Adidas Boosts were not so fresh any more! I started the run wearing a Santa hat, but this got lost somewhere along the way! One of my slowest 5km times at 30:06, but at least I stayed upright! I went a little further afield the following weekend to Valentines parkrun. There was around 75 people out for this freezing cold post-Boxing Day parkrun, and we were all eager to get started and warm up. I enjoyed this flat 2 lap route which was on concrete paths around the lake. I finished in 27:34, but I’d forgotten my barcode so not an official time. Back to Valentines Park for their New Year’s Day parkun, and this time a huge turn-out of nearly 200 people. Many of the runners were ‘doing a double’ having completed the earlier parkrun at Wanstead. The weather was milder and I was more familiar with the course. I was determined to start the New Year with a new personal best, and I was chuffed to finish in 26:24! I’ve been trying to get below 27 minutes since June 2012 and I finally cracked it! Last weekend, I joined a few friends from Havering Tri for a 10km at the Queen Elizabeth Olympic Park. The 10km series is held on the first Saturday of each month, from October to March, so we thought it would make a good start to the New Year. I’ve ran in the Olympic Park twice before, but never in such bitterly cold conditions as last Saturday. I think it’s fair to say that we were all a bit reluctant to start running, as the wind and rain lashed against us, it was easier to stay in the warmth of the Podium Cafe! The course was three undulating laps of the park taking us along the canal and past the Stadium, Aquatics Centre and Orbit. I’m pleased with my pacing, I kept a fairly consistent speed completing the laps in 19:00, 18:59 and 19:05. I found this a tough run due to the weather, the wind was relentless and I was soaked through. I finished in 56:41 and waited at the finish to cheer in the other girls. My time was only 11 seconds slower than my 10km PB, so I reckon I’d smash this course if the weather was right! Nikki, Hayley and Amy went to swim in the Olympic Pool straight after, but I headed home to warm up! 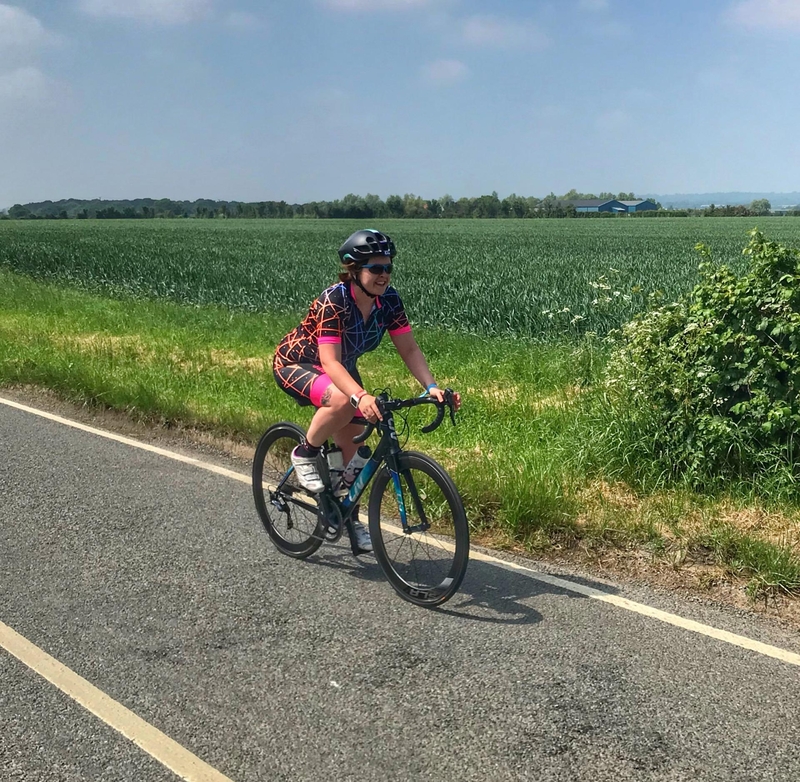 I felt absolutely shattered after this race, it took an afternoon in bed to recover!